I'll bet some of you out there will recognize where this was taken. It's the lobby and main staircase of the Alliance Française, the language school in Paris that our study abroad group attended in 1981-82. The calm before the storm; classes started again the week after I took this photo. The buildings have had some face-lifting done in the past thirty years, and one of the old buildings (where Ken's office was) was demolished and replaced back in the early nineties. I think there are apartments in the new building. 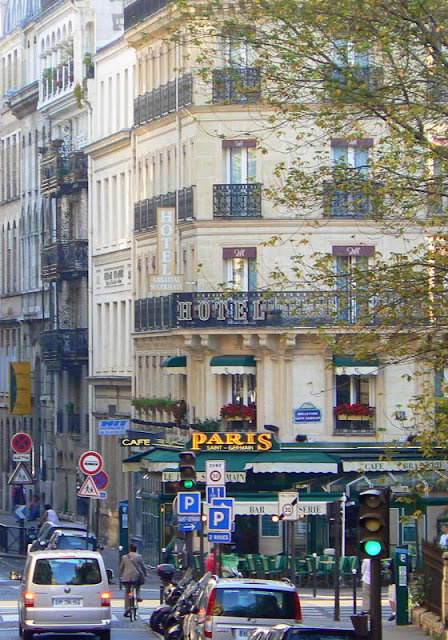 I walked through from the rue de Fleurus to the main courtyard and out through the entrance on the boulevard Raspail. Oh, the memories. This is the last photo from inside the Luxembourg garden. Right next to the gate on the rue Guynemer, on the left side, is one of the sections of the garden that's made in the English style. The first glade is built around a statue of Edouard Branly, a doctor and physicist, who was one of the pioneers of radio and wireless radio telegraphy. You can look that up. The typical Parisian park chair in the Luxembourg garden. Monsieur Branly is credited with pioneering what we know as the wireless remote control. He might also be blamed for why we all have fifteen remotes wandering around our homes. Seriously. I have at least four on the coffee table in the living room. And four more in the family room. Thank you very much, M. Branly! Of course, I'd rather get up and look for the remote than get up and change the channel manually, n'est-ce pas? I've actually finished with the hedge trimming. 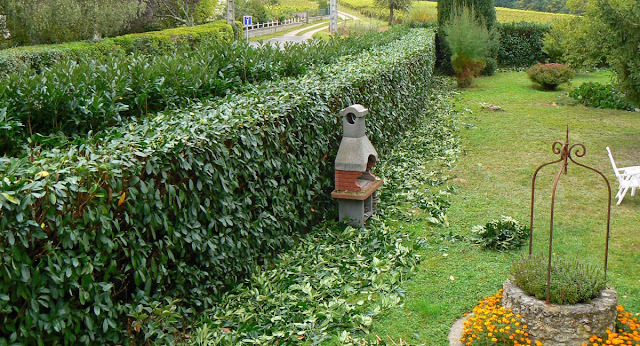 There's still the cleanup to do, but the long hedge is finally trimmed. I also have to trim the tall bay leaf tree. That's a whole 'nother can of worms. But the big job is done. This more or less before. I had trimmed the inside of the hedge, but not the top or the outside. 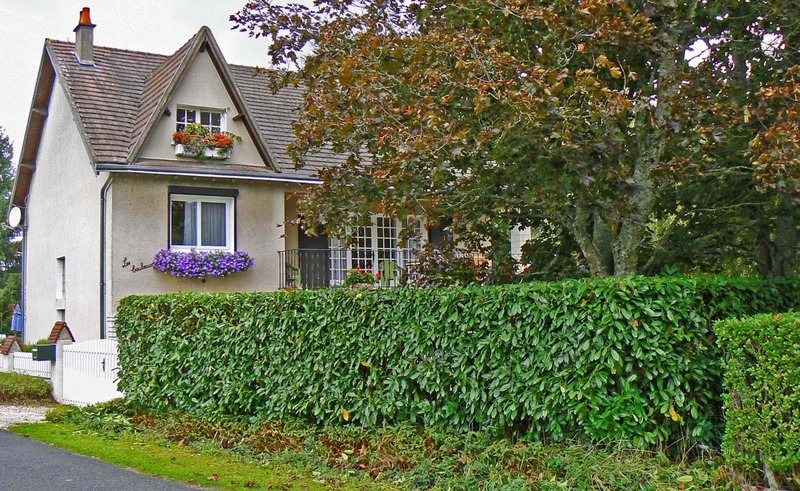 These are photos of the longest stretch of hedge along the road. It goes from the house to the end of the property and around to the back gate. Now I've done the top on the inside. The hedge is too wide for me to reach across from one side. I took pictures, as I always try to do, of the before, during, and after trimming. I hope you appreciate how much fun I have doing this. I've decided that the only way to make it tolerable is to divide it into sections and celebrate as each section gets done. And now this section is completely done. Except for the cleanup, of course. And that is precisely what I do. I calculated (thanks to my spreadsheet) that I worked on the hedge for a total of eight days. Over those eight days, I worked ten and three-quarter hours. If you've done the math, you can see that it works out to an average of one and one-third hours per day. But hey, I'm retired. I can take my time, right? That is a six-foot ladder... six inches taller than me. So you can see how tall that darned hedge is. 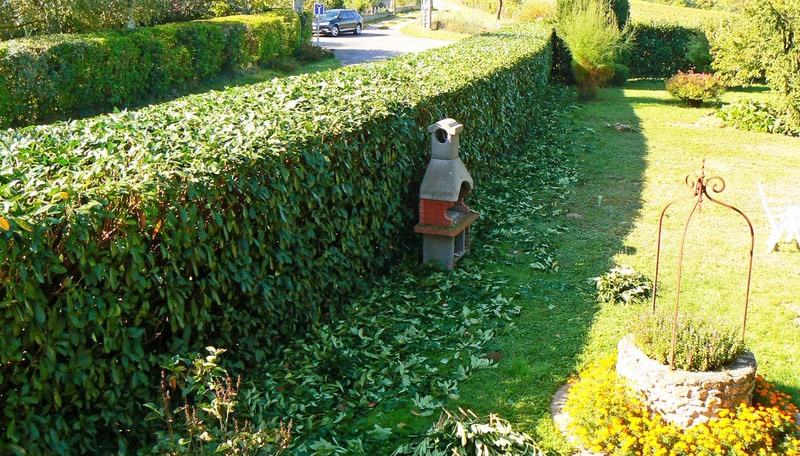 I was very lucky this year that the weather has been spectacular during the hedge trimming season. No cold, no rain, no wind. Just nice sunny days and me working in a t-shirt. Very pleasant. Thanks for sticking with me! Remember, I have to do this again next year. Just as I was about to exit the Luxembourg garden on the west side (rue Guynemer), I turned and saw the dome of the Panthéon through the trees. From where I was standing, the dome is about 700 meters (just over a third of a mile) away. Looking east across the Luxembourg garden toward the Panthéon. The picture is taken into the morning sun which accounts for the misty quality, but I like it. The zoom lens makes the dome loom large in the photo. 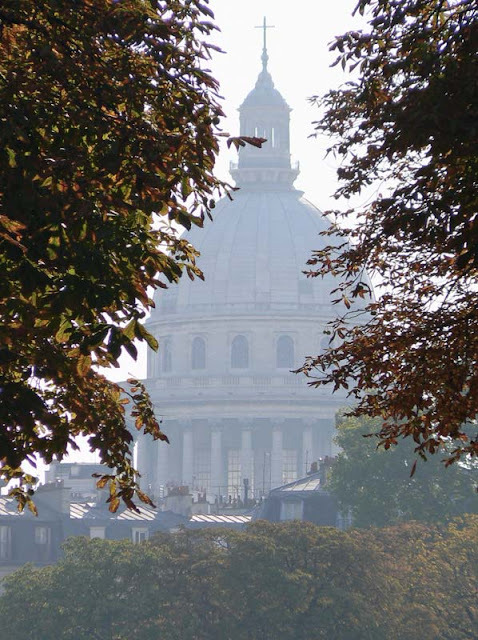 The Panthéon was built as a church in the eighteenth century atop the Montagne Sainte-Geneviève, a high spot on the left bank named for the city's patron saint. The church was intended to receive the relics of Sainte-Geneviève, but before the building was consecrated as a church, the French government decided it would be used as the final resting place of great men of the Republic (post revolution). As it was a beautiful summer morning when I took this walk, I was not at all surprised to see people already on the tennis courts in the Luxembourg garden. That unmistakable "pop" of a tennis ball hitting a racket was echoing through the geometric forest. I stopped to watched a couple of volleys, then I was on my way. Court number three in the Luxembourg garden. Click to serve and volley. I became a tennis fan back in my high school days, in the mid seventies. Those were the days of Jimmy Connors, Chris Evert, John McEnroe, Björn Borg, Ilie Năstase, and Martina Navrátilová, to name a few. I liked to play, but never played in any organized fashion, except for high school gym class. That was no fun because the jocks saw tennis as an opportunity to hit the ball as hard as they could at the heads of those of us who were less athletically inclined. And it was always doubles play (if you could call it play) and I spent most of the time ducking rocket-fast balls flying at me. I had more fun just playing pick-up games with friends after school and on weekends. When no one was around I'd bang the ball up against a wall somewhere. I was never really good at it and after a while I dropped tennis for a long time. I started watching tennis on tv again in the mid eighties. Those were the days of Andre Agassi, Boris Becker, Steffi Graf, Stefan Edberg, Arantxa Sánchez Vicario, Ivan Lendl, and still Martina Navrátilová, to name a few more. I picked up a racket again in the nineties and took tennis classes at our local community college. I even played outside of class when I could find a partner. I still wasn't very good, but I enjoyed the game. I went to my first Grand Slam tournament in 1997. You guessed it: the French Open in Paris. What a thrill that was. Ken and I had tickets for the women's final and the men's final that year. We watched Iva Majoli beat Martina Hingis in an real upset, then watched Gustavo Kuerten win his first of three French Opens, beating Sergi Bruguera. I've been back to the French a few times since then, enjoying earlier rounds and more matches. The only other pro tournament I've been to is the Bank of the West Classic at Stanford in Palo Alto, California, a few times when we lived in San Francisco. For the past fifteen years or so I've followed a lot of tennis on television, but I haven't played since 2002. There are so many sports channels available on tv these days and there is a tournament being televised from somewhere in the world almost every week during tennis season. And just in case you're wondering, the professional tennis season begins in January and concludes at the end of November. 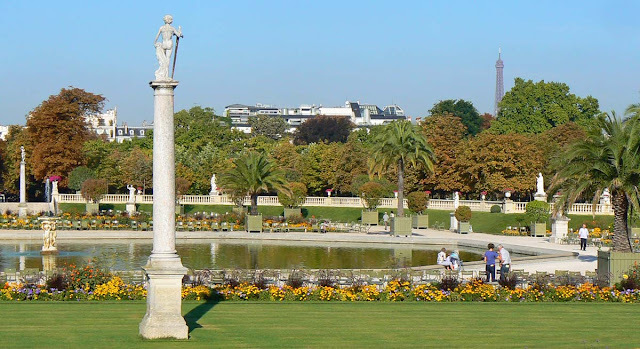 The Luxembourg garden is composed of three primary gardens. The first is the very formal French garden directly in line with the north-south axis of the palace. This is where the bassin and fountain are located. Along the western edge of the park are the English style gardens with their curves and more natural looking plantings. Between the two is the geometric forest, with trees planted in what's called a quinconce (quincunx) pattern, an alignment of groups of five laid out like the five side on a standard six-sided die. A diagonal path through the geometric forest. Click to quincunxinate. The result is a stunning array of trees that line up in every direction you look. Paths through the forest follow the alignments north and south, east and west, and diagonally. Not being a landscape architect, I didn't know this layout had a name nor that it is one of the standard patterns for orchards. I'm learning this as I go along. Ah, the wonders of the internet! This is one corner of the Luxembourg palace, once the residence of Marie de Médicis, wife of King Henri IV and regent for her son, King Louis XIII. It was built in the first half of the seventeenth century. The park I've been showing you pictures of was the palace garden, a very private place in its time. The gardens are a public park now, and the French Senate meets inside the palace. The southwest wing of the Palais du Luxembourg seen from the across the bassin. The two round towers you see in the background are the bell towers of the church of Saint-Sulpice. When I first lived in Paris in 1981, the place I lived was just a couple of blocks from this church and the beautiful square and fountain in front of it. For some reason I didn't wander up there on this walk, so no photos. But it's well worth a visit if you're in town. La Tour Montparnasse (the Montparnasse Tower) was, until this year, the tallest building in France. The new tallest building is in the Défense development just outside of Paris. The Tour Montparnasse is still the tallest building inside Paris (210 meters), topped only by the Eiffel Tower (325 meters) which is categorized as a communications tower as opposed to a "building." 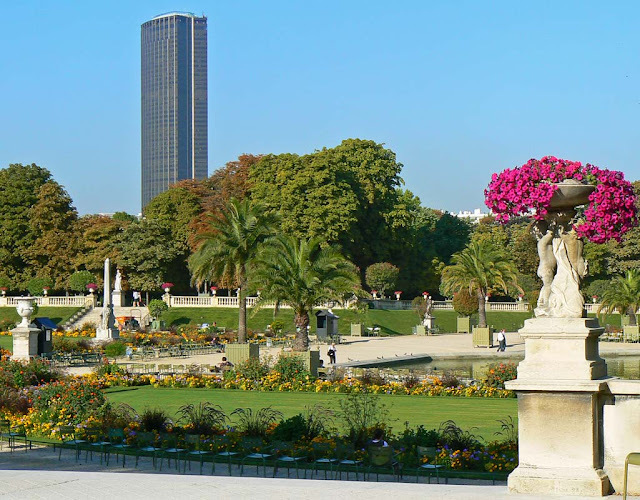 La Tour Montparnasse seen from the Luxembourg gardens. The 59 story tower, built in 1972, has had many critics over the years. Too tall! To ugly! They said the same thing about the Eiffel Tower when it was built. But I've never felt that way about the Tour Montparnasse. 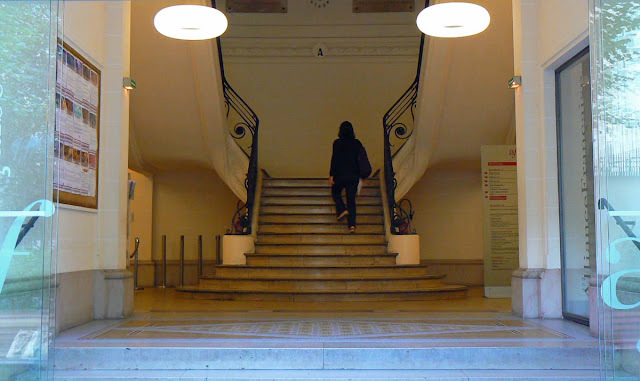 I'm one of the few people I know who actually likes the building and where it is in Paris. I think of it as punctuation, like a giant exclamation point. It also has a terrific observation deck without any of the mob scene you find at the Eiffel Tower. The building is at the top of the rue de Rennes and marks the location of the Gare Montparnasse, one of Paris's six major train stations. It's the fourth busiest station in the city with over 50 million passengers going through it each year. 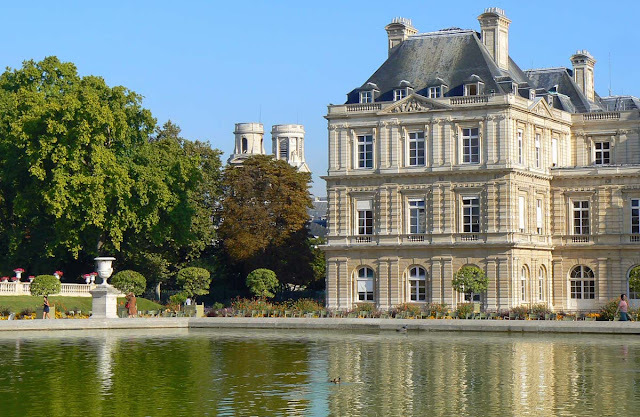 The central feature of the Luxembourg garden in Paris is the bassin (fountain pool). It sits in a section of the park that is sunken below street level, creating the illusion that the trees in the park above are taller and that you are even more secluded from the city than you are. 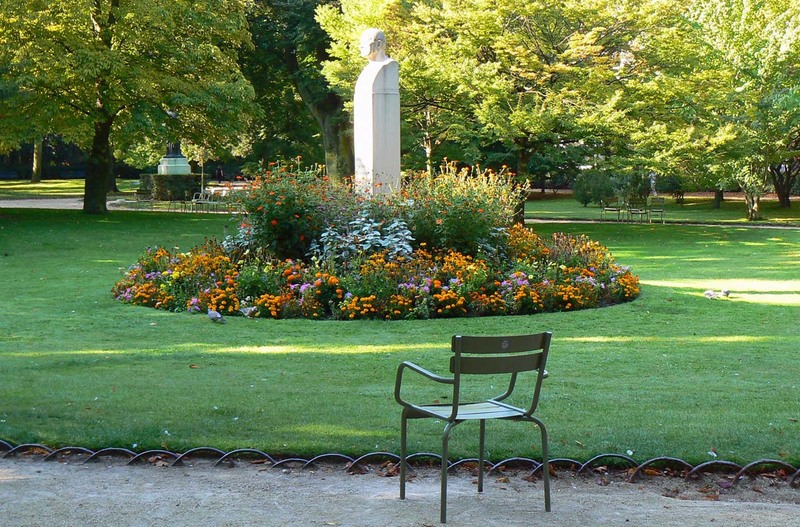 A late summer morning in the Luxembourg garden. The leaves on the chestnut trees have begun to turn. The park is filled with sculpture. The statue atop the column in the photo is of David, Killer of Goliath. The sculptor is unknown. According to my research, this statue is a copy made in 1993; the original is back inside the palace where it was before being moved into the garden in 1840. From the eastern side of the bassin (where I'm standing to take this picture) there are great views of the two tallest towers in Paris. The first is the Tour Eiffel, seen here. The second is the Tour Montparnasse. More about that tomorrow. When I lived in Paris thirty (!) 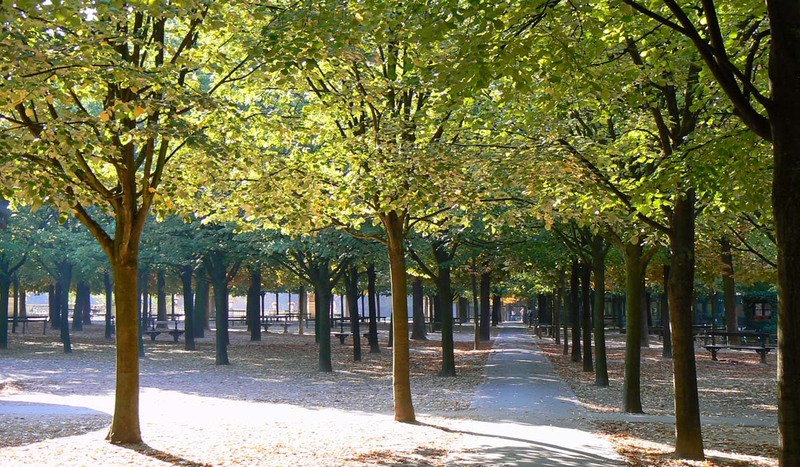 years ago, I used to walk through the Luxembourg gardens frequently. The pension (boarding house) I stayed in was not far from the entrance on the north and the school I was going to was a few blocks from the west side of the park. When I moved into an apartment across town, I could take the RER B line from there to the Luxembourg station and walk through the park to school. I don't think the Pavillon is open all year round. But it certainly is in the summer. The park is beautiful, in my opinion, all year long, even in winter. You can get lost along the shady pathways around its edges or stroll in the brilliant sunshine (when it's sunny) around the central fountain where kids are often sailing little toy boats. You can sit and read or watch people go by. 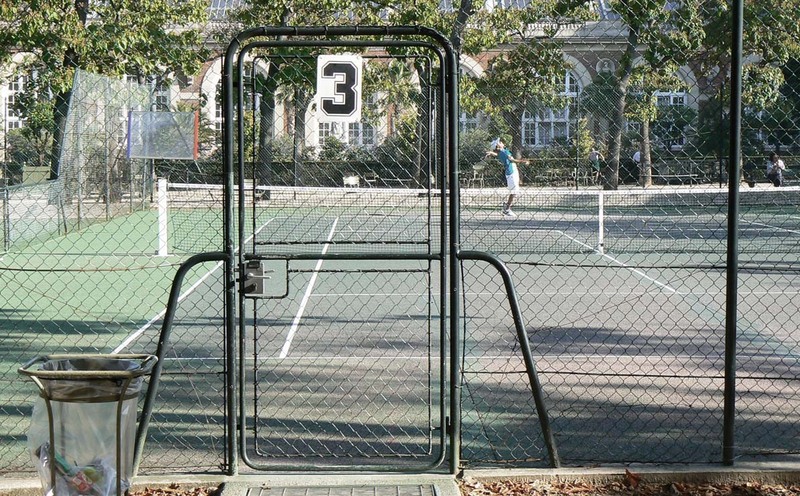 I used to watch people play tennis on the several courts in the park. Back then I think that they were clay courts; now they're paved with a hard surface. You can even have a drink or an ice cream at the Pavillon de la Fountain, pictured here, something that I've never done. The park is named for the Palais du Luxembourg built for Marie de Médicis in the seventeenth century. She had the garden behind the palace designed and built in the Florentine style. In the years since the French Revolution, the garden has been modified and rehabilitated several times, and it was eventually opened to the public. The French Senate meets in the palais on the north boundary of the park, as it has since 1799. After passing the Sorbonne, I took a right into the rue Soufflot which runs between the Pantheon on the east and the Luxembourg gardens on the west. Although it was Friday morning, it was still the last week of summer vacation, so the sidewalks were relatively calm. I saw a few people in suits enjoying their morning coffee in the sun before heading to work. A typical Parisian café on a sunny morning. Just a few doors down is a Quick Burger and across the street is McDonald's. I didn't stop at a café until much later in the morning. I just felt like walking for a while and knew that when I got tired, there would be an inviting café pretty much wherever I ended up. I made my way along the rue Soufflot to the entrance of the Luxembourg gardens on the Boulevard Saint-Michel, Place Edmond Rostand. 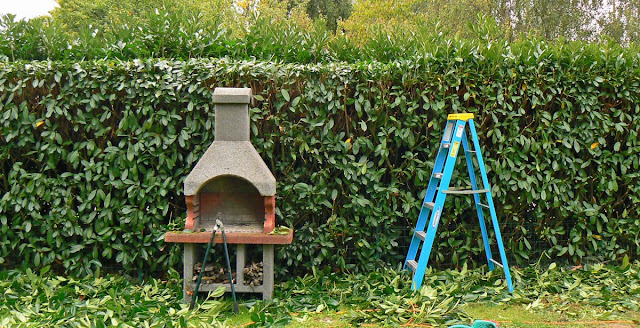 ...to bring you up to date on this year's hedge trimming extravaganza. Yes, it's that time of year. 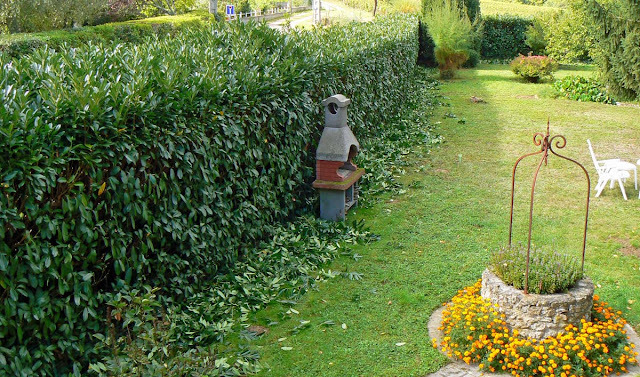 You may recall that I hurt my neck late last summer and was unable to trim the hedges. I've been dreading cutting two years of growth from them this year, but it's actually going very well. Before getting started. The hedge is full and bushy this year. The section of hedge pictured here (you can only see about a third of this section's length) is arguably the most difficult to trim. It's definitely the highest section, which means I'm up teetering on a ladder to do the top. But the side you can't see is up against a neighbor's rusty chain-link fence, and there's not much maneuvering room back there. Not to mention that his shrubs and the hedge tend to reach out and grow together, along with his vines (some of which are quite thorny). Once I do the side, I have to get the ladder back there to do the top. The hedge is too wide to cut the top from one side only. Ugh! This section is done! The remaining chore is to gather up the trimmings and mulch them. But, as you can see, I'm done with this section. It took two and half hours over two days and it went pretty well, aside from a few scrapes and punctures from thorns. I also got a nasty poke in the eye from a branch and was quite uncomfortable for about twelve hours, but all is better now. I did this short section along the road on Sunday. Took about an hour. I didn't take a before shot of this part. As is my wont, I built a spreadsheet to track my hedge trimming. At Ken's suggestion I am keeping track of the time it takes to do the whole thing. 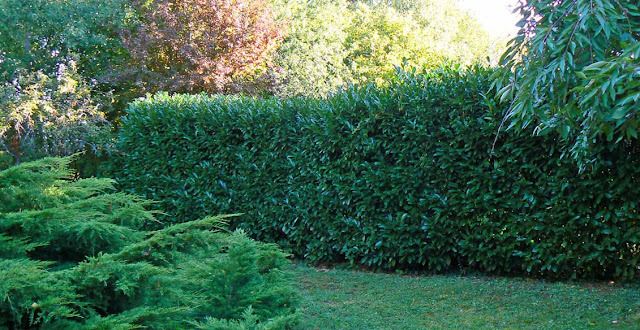 I measured the first section of the hedge and it comes out to about 29 meters in length, which is about 95 feet. The section in the last photo, along the road, is 6 meters long (19.5 feet) and it took an additional hour to trim. The total hedge, which wraps around three sides of the yard, is close to three times what I've cut so far. I'll measure it all and let you know. Back to Paris photos tomorrow! Before my walk officially got started, I needed to go to an ATM for some walking around cash. I knew my bank had a branch in this neighborhood, and I thought I knew right where it was, but I ended up circling a block or two before I found it. Looking down the rue Monge toward the spire of the Sainte-Chapelle. No matter, the morning was glorious. I found my bank and got some cash then made my way down the rue des Ecoles and walked up past the Sorbonne toward the rue Soufflot. L'hôtel Abbatial and le café Paris St. Germain. Below the hotel is a café called le Paris St. Germain. 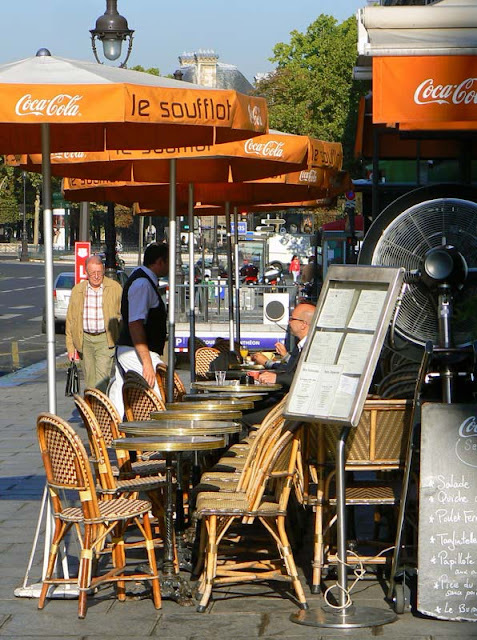 It's at the corner of the Boulevard Saint Germain and the rue des Bernardins. I really liked that the neon sign was lit. It was a Friday morning and while my cousin and his wife went to the Louvre, I took a long and leisurely walk across the Left Bank. The morning sky was milky, but the fog burned off quickly and the sky turned clear and blue. *UPDATE: Well, the rates are reasonable for three Sunday nights in February. After looking around a little more on their website, I find that the teaser rates are just that. Actual rates are much higher. Oh well. Moles have become the bane of my existence here in rural France. When we first moved here there were no moles in our yard. But after a couple of years they moved in. They especially like the area around the vegetable garden since it's watered during dry weather. The watering attracts the things moles like to eat: grubs and worms. 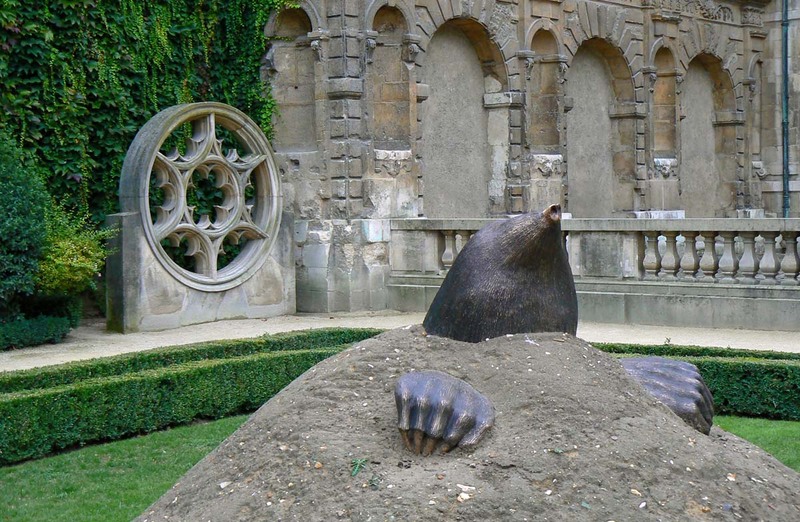 A sculpture of a giant mole emerging from the garden at the Hôtel de Sully in Paris. Not satisfied with the meals I'm unintentionally preparing for them, the moles have branched out into other areas of the yard. They don't do any real damage since they don't eat plants, but they raise hills of dirt all over the yard. Every time I want to cut the grass, I have to go out and remove the mole hills with my shovel and wheelbarrow. I use the dirt I collect for the garden or other areas of the property where we need a little clean fill. A bad photo of a dead mole, Bertie's latest capture. It was about 6" long, nose to tail. The moles aerate the ground, and that's good. But moving mole hills every couple of weeks really gets old. My lawn, such as it is, is pock-marked with round bare spots where the hills stood. And in the sections of the yard where the moles are particularly active, their tunnels make the ground very spongy. I have learned to live with the moles. But now we have Bertie. I'm hoping he takes a liking to moles. He's brought us two so far. The first was still alive and I had to kill it so it would not escape back into the yard. The second, brought to us just this week, was dead. But Bert didn't eat it; he just left it for me. I really praised him for getting a mole and encouraged him to get more. I can only hope he understands. 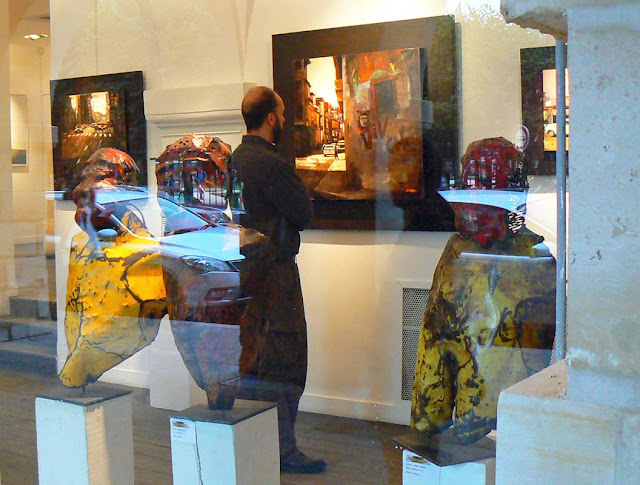 Here's my cousin Mark checking out paintings in one of the galleries in the Place des Vosges. I took the picture from outside, through the window, which accounts for the glare. He looks so serious. I wonder what he was thinking? I think the paintings were scenes of New York City. A. I can do that. Heck, I can do better than that. B. I can't believe they're asking that much for this crap. C. I'm really diggin' the surreal post-abstract neo-expressionism of this piece. D. I want a hamburger. That's a funny name for a street. Mule's Step Street. I think that's what it means. The street runs between the Place des Vosges on the west and the Boulevard Beaumarchais on the east. On our way from the Bastille back to the Marais for dinner, I wanted to show Mark and Julie the Place des Vosges and we took this street in. I like this photo better without the color. I don't know who this guy is, either. La rue du Pas de la Mule begins on the northeast corner of the Place des Vosges. 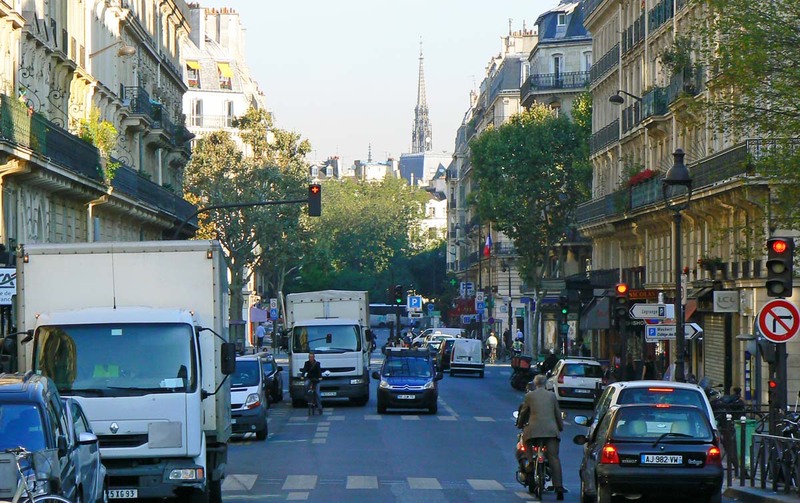 It's the extension of the rue des Francs Bourgeois, which crosses the Marais district and is home to countless shops and art galleries and not a few cafés and eateries. The Café Hugo (in the photo above) is one of several cafés built under the arcades of the place. I forgot to tell you that, during drinks at Le Métro, we decided to have dinner at one of my favorite pizzerias in Paris. 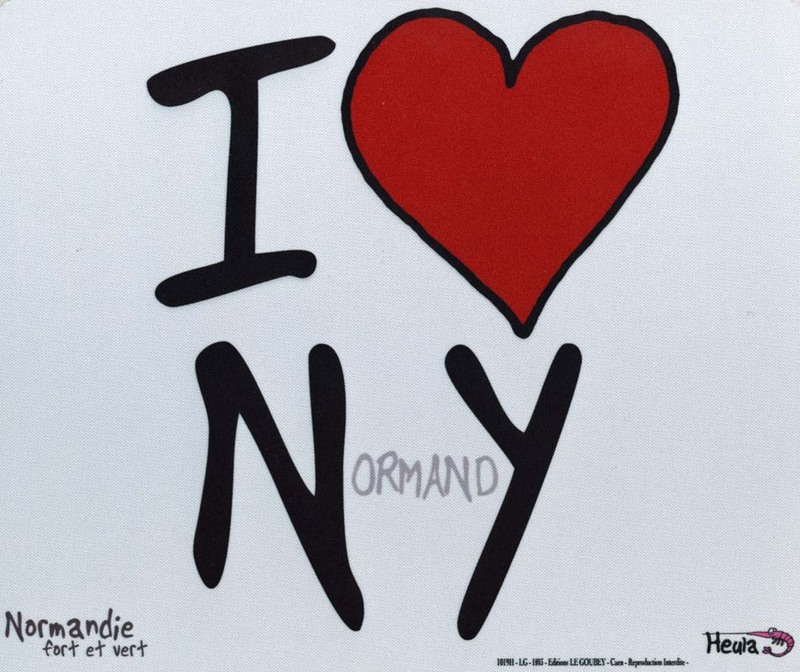 It's in the Marais district on the right bank. To get there, we would have a nice walk over the islands to the other side of the Seine. I steered us over to the Bastille before heading back into the Marais. I don't know who this guy is. He just ended up in my photo. 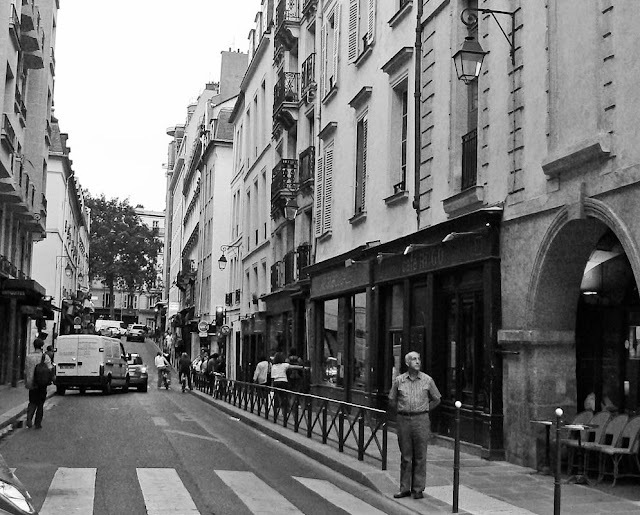 I snapped this photo on the rue Saint-Antoine as we approached the Place de la Bastille. You can see the Colonne de Juillet in the background. The column sits in the middle of the place where the medieval Bastille prison once stood. If you're like me, you might have thought that the column commemorates the French Revolution but, like me, you would have been wrong. 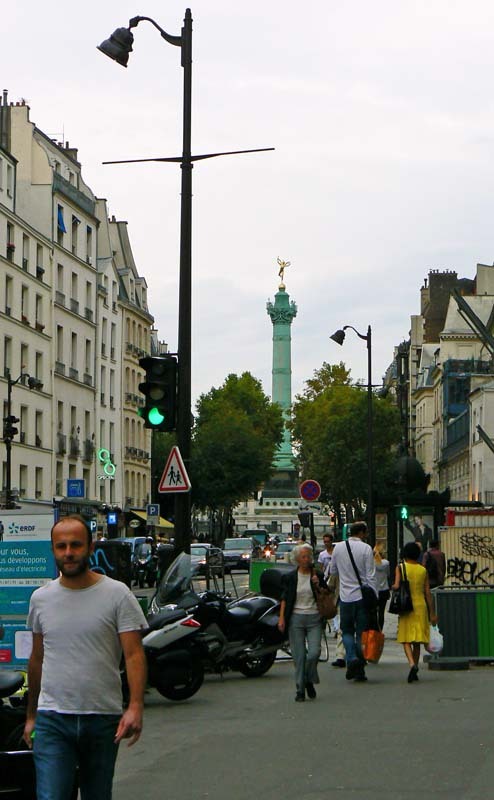 The column was erected to commemorate three days in July 1830, known as les Trois Glorieuses (the Three Glorious Days), a mini-revolution that led to the downfall of King Charles X, who attempted to reverse the revolution and re-establish an absolute monarchy. A curious custom developed in Europe sometime in the 1980s: young couples would symbolize their love by inscribing their names or initials on a padlock and attaching the lock to some public structure. The custom eventually evolved to attaching locks to bridge rails and tossing the key into the river below, sealing the relationship forever, as it were. Can a love lock be picked? Our existential question of the day. Click to lockitup. The custom of attaching "love locks" first appeared in Paris on the Pont des Arts, a pedestrian bridge in the city center frequented by young artists and lovers (not to mention tourists). 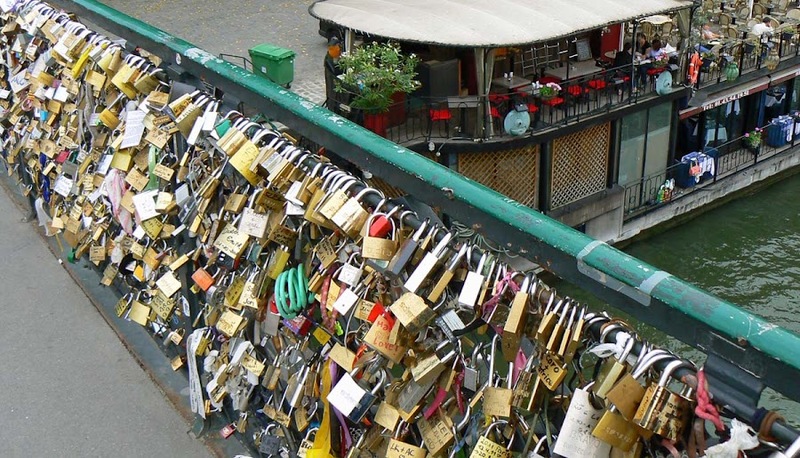 The city estimated that in 2010 there were upwards of two thousand locks attached to the bridge. Officials warned that they would be removed, citing them as damage to a historic structure. Although the city denies actually removing them, most of them disappeared in May, 2010. That hasn't stopped the practice, though. The bridge in the photo above is the Pont de l'Archevêché on the upstream end of the Ile de la Cité. As you can see, the railing (which faces the cathedral of Notre Dame) is practically obliterated by love locks. As usual, the information I relate here comes from Wikipedia. While my photos are true and accurate representations of what I see, I claim no accuracy whatsoever in my reporting. Have a nice day. 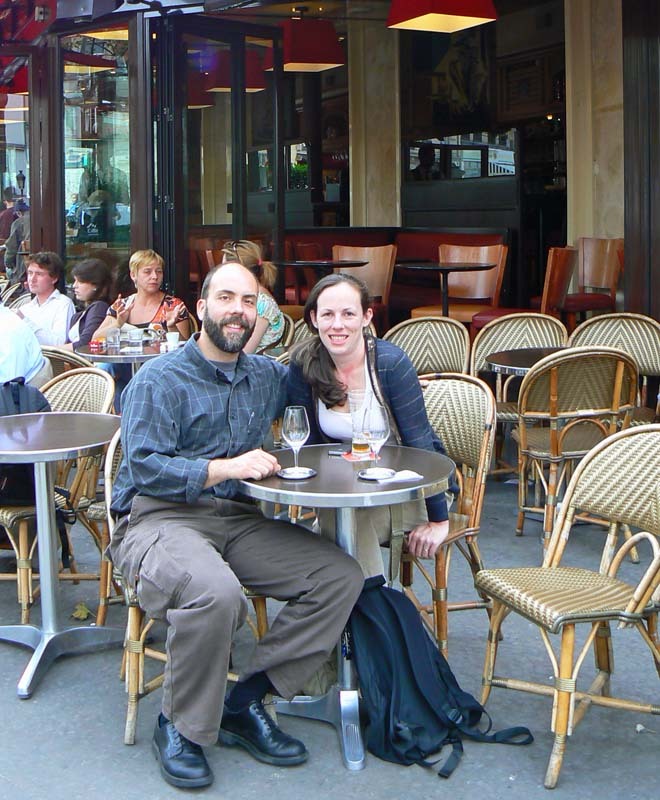 My cousin Mark and his wife Julie came to Paris for their honeymoon. They were married in upstate New York just before tropical storm Irene arrived and flew out just after it had moved on. I went up to Paris to see them and spend a couple of days. I was lucky to be able to ride with our friends Evelyn and Lewis who were returning their rental car to Paris around the same time. Mark and Julie at Le Métro café in the Place Maubert. Mark and Julie stayed in a very nice hotel in the Latin Quarter and I had found a room in another hotel close by. Less nice, but it worked for me. Being in the same neighborhood made it easy for the three of us to meet up for our adventures. The weather turned out to be quite warm on Thursday evening, and it was downright hot on Friday and Saturday. After I checked into my hotel, I met the Mark and Julie at their hotel and we walked to the nearby Place Maubert for a drink and to plan what we'd do in our short time together. Mark is an artist; you might remember that I've talked about him before and that I have a print of his hanging in the house. He also works part-time in a wine shop. At the café, Mark ordered a glass of chardonnay and I ordered a glass of sauvignon. The waiter mixed them up. After one sip, we both recognized that we had the wrong glass and exchanged. We were off on the right foot. After the Normandy trip, our friends Evelyn and Lewis came to the house for a few days before heading up to Paris to wrap up their trip. We had heard from Mike (el loco & el lobo) that he and his friend Gustav and Munson the Alaskan Malamute would be coming through our area on Tuesday on their way back to southwestern France from Scandinavia and the U.K.
L to R: Evelyn, Mike, Gustav, Lewis, and Ken. American, Australian, and Swedish. Mike had reserved a room at a local bed and breakfast for the night and was planning on stopping by for drinks that evening. I got an email that afternoon from Mike saying that the B&B contacted him and told him there had been an error; they overbooked and they did not have a room for him after all. And he was about an hour or so away. I gave Mike the names of a couple of local hotels, but also, half seriously, told him we could pitch the camping tent in the back yard if they wanted to sleep here. They discussed it and decided to take us up on the offer! 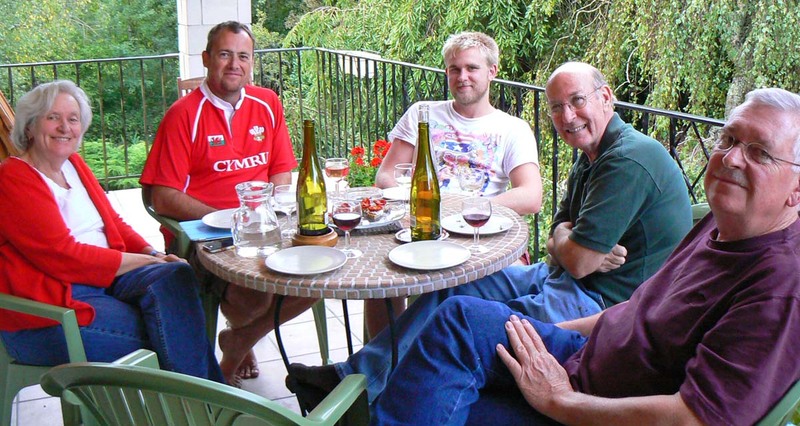 We sat around the table on the deck that evening enjoying some lively conversation along with wine and little plates of pâtés, cheeses, oven roasted tomatoes, and other finger-type foods. After a while a few of us went out and set up the tent. We had camping mats, pillows, and an extra sleeping bag (Mike had one sleeping bag in his car). It was a chilly night but there was no rain in the forecast. The next day we all got up and had coffee and toast after which the guys (with Munson) headed south. We had arrived in Normandy on a Monday afternoon and I was scheduled to head back home on Thursday. Bertie was alone at home and we thought three days was enough for the first time. Ken stayed on with our friends and came home by train on Saturday. One of the prettiest streets in Bellême. See the sundial? 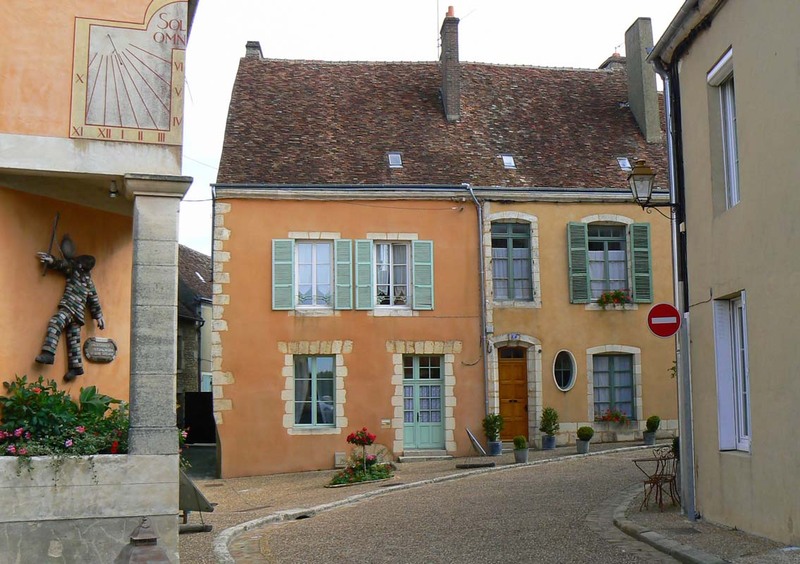 On Thursday morning (two weeks ago now) we all drove over to the nearby town of Bellême to see the town and walk through their market. The market was nice, but the town was even nicer. It's very small with about 1,500 inhabitants, but the center of town is nicely maintained and there is plenty to see. We spent a couple of hours wandering through the market and the neighborhood around the ruins of the old château before Callie and I headed south for our three hour drive home. Bertie was nowhere to be seen when we got home, but he was there and ready for his breakfast early on Friday morning. He harbored no ill will for having been left behind. So this is the end of the Normandy photos for now. And the end of the collection of posts that begin with "The..."
On one of our morning walks among the corn fields, Callie and I were treated to this really cool view. Well, I was. Callie was much more interested in smelling the ground. It was almost as if the cloud was landing out in the corn fields. Click to ennebulate. I think it had rained over night, if my memory serves, and this was what the clouds looked like as they were breaking up after sunrise. While in the nearby town of Mortagne-au-Perche, we stopped and ordered a few pizzas to take back to the house for lunch. Instead of standing around waiting for them to be ready, we ducked into the church around the corner for a look-see. 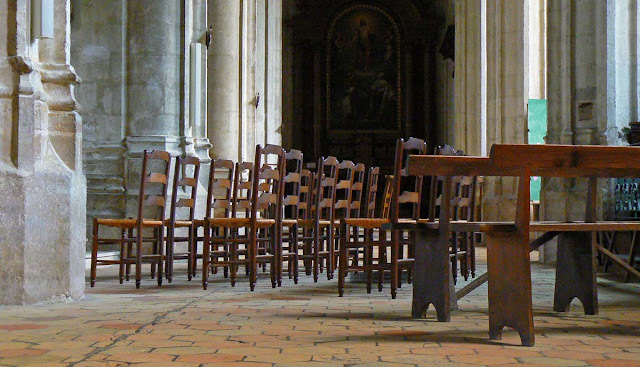 Standard wicker chairs and wooden benches in the church at Mortagne. It was your standard French church, not particularly spectacular, but fun to ramble around in for a bit nonetheless. I took a bunch of photos, but it was very dark and most of them came out blurry. I took a few by putting the camera on a table or other surface and they worked fine. Our rental house in Normandy used to have shutters on the windows, but now it doesn't. I know that there were once shutters because these tiny metal objects were fixed into the exterior stone on either side of the windows. The shutter thing called Jacques (I made that up). Once opened, shutters need a mechanism to hold them against the wall of the house, otherwise they will swing freely if there's any breeze. That's what these human-shaped things do. 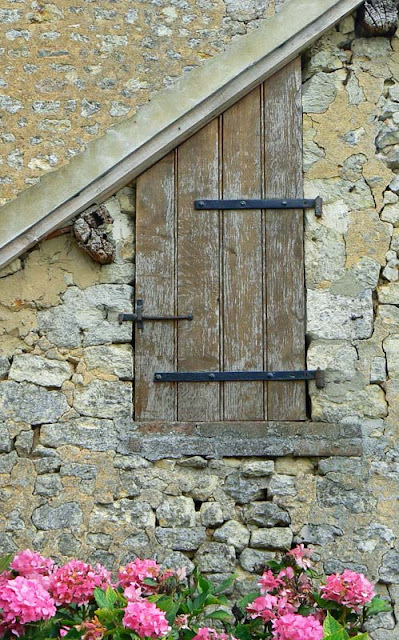 You turn them down to release the shutter or put them in the up position (as seen in this photo) to hold the shutters in place. I wonder if they have a name (other than Jacques). *** UPDATE: Although I like Jean's name (see the comments), Ken found out that this is called un arrêt de volet (a shutter stop). Logique, non ? As many of you know, Callie does not like to ride in the car. She does it, but under protest. Once we get where we're going, however, she's quickly back to her old self. Especially if there are tennis balls to chase. Callie checks out a bug on the little road near our rental house. I brought one of her balls with us, and Evelyn and Lewis brought her two new ones from America. She was in tennis ball heaven! 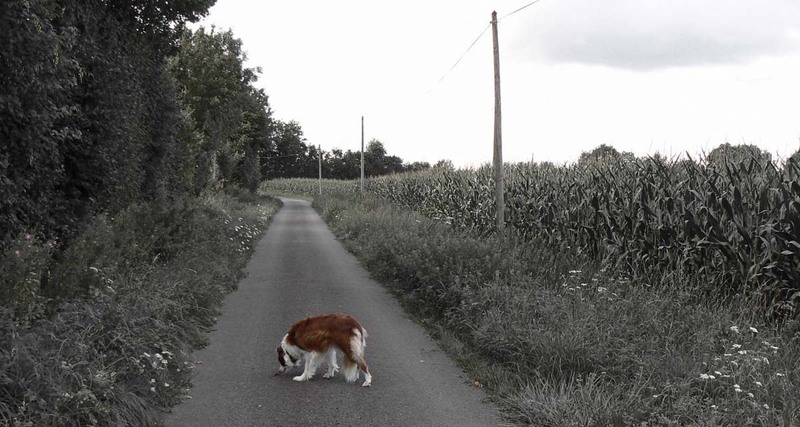 We kept up the routine of a morning walk and an evening walk while we were in Normandy. It was nice that we were in a place where a leash wasn't necessary, so it was just like home. At one point a rabbit crossed the road and Callie chased it into the cornfield for a few seconds. She does the same thing at home, it's just that instead of corn we have grape vines. The barn at our gîte had some nice doors leading into what had to be lofts above the main floor. Of course, we never got in to see, nor did we particularly want to, but I wonder what, if anything, was up there. One of two doors leading into the barn lofts. Since there were open windows in the barn, I suppose that birds, owls, or bats could easily get in and build nests. We will never know. If I'm lucky, I will have just returned from a quick couple of days in Paris as you read this (I'm posting in advance again). A cousin of mine just got married and he and his wife are honeymooning in Paris. I went up to spend a couple of days with them while they're here. It took us a few moments to figure out the sign that was posted on the barn door. 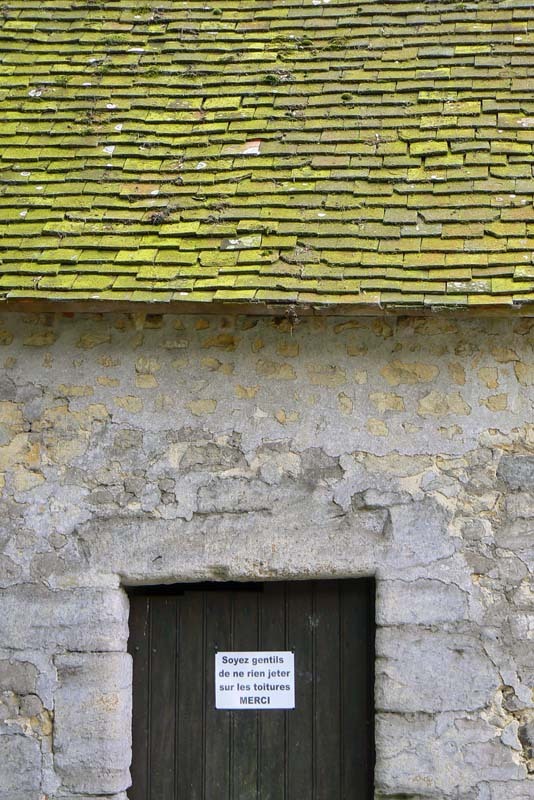 It says, "Soyez gentils de ne rien jeter sur les toitures. Merci." Please be kind enough not to throw anything up onto the roof. Thank you. Why would we want to throw anything up onto the roof? A sign on the barn door. Then it occurred to me. Kids would love to throw balls up against the walls and up onto the roof and catch them as they came back down. I'm sure many roof tiles have been broken that way. We were good and didn't throw any balls up there. We did throw balls out into the yard for Callie to chase. Ken surprised me with a present when he got home. He found Normandy mouse pads, and this one was apparently calling out my name. Normandy: strong and green (that's what it says in the lower left corner). It's green because it rains a lot up there. I'm from New York, you see. So it kind of makes sense. He got one for himself, too. I'll let him show you that one on his blog. Here are a few gratuitous photos of some of the flowers growing around the farmhouse in southern Normandy. I don't know what they are, but that's ok. I'll just make up names for them. This one's a prime example of whitus spikyum. 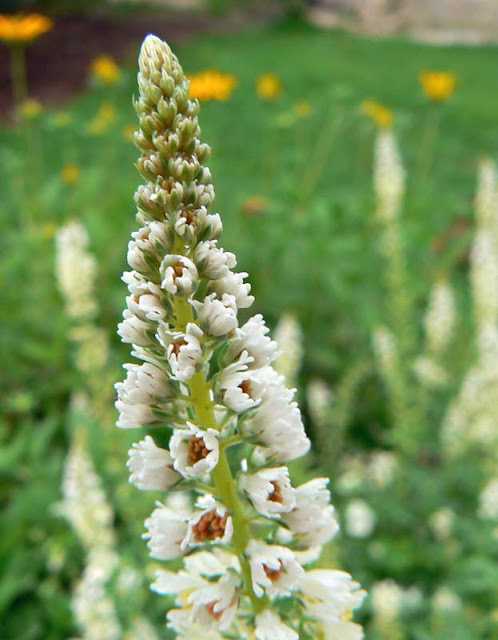 Its common name is That White Spiky Flower. 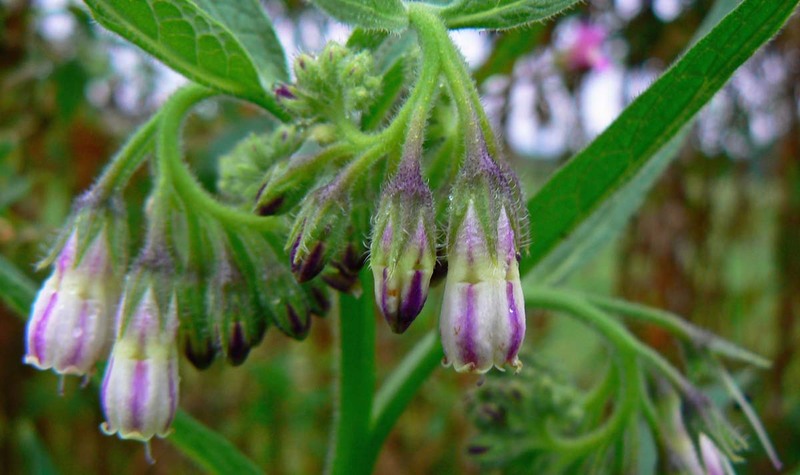 This one is often mistaken for a normal daisy. In fact, it's daisyjaundis closeyface. 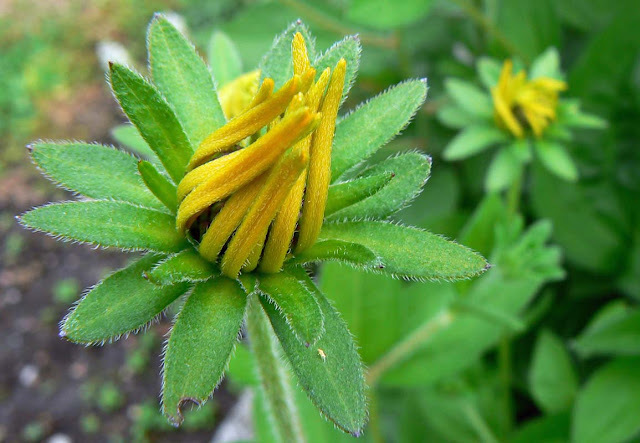 Its common name is Yellow Daisy Without Sun. 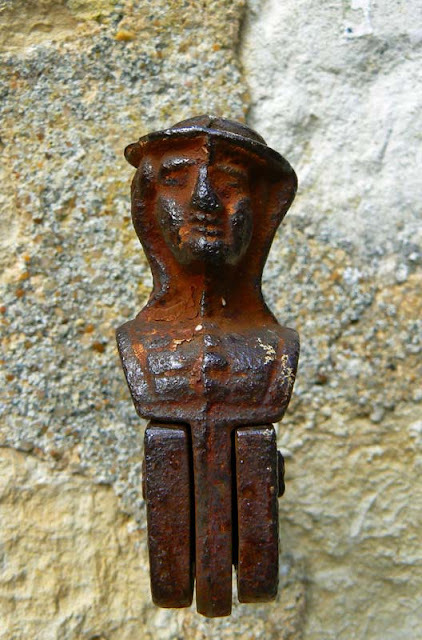 This one is a protected species in the Perche region. The famed youdontknowwhatitis grows wild along the roadside. Its common name is Darryl. And that's it for Fractured Botany Today. Join us again. Or not.